Mark Dean, Kathy & Rick Hilton. 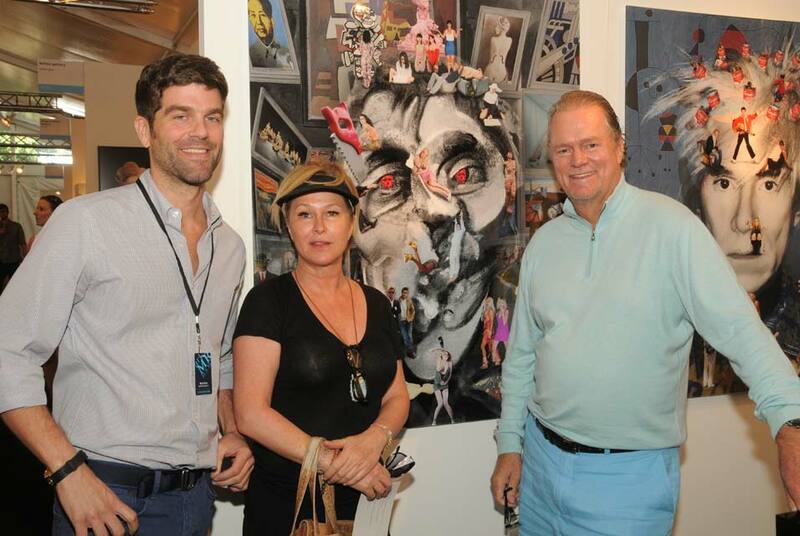 BRIDGEHAMPTON, NY.- The second annual artMRKT Hamptons, founded by Max Fishko and Jeffrey Wainhause, closed on a high note this past Sunday, with exhibitors reporting steady sales and strong attendance throughout the weekend. The well-heeled Hamptons crowd strolled through the tent on the Bridgehampton Historical Society grounds -- some with canine pals in tow -- scooping up works ranging from sculpture to works on paper, to paintings and photography. Further proof that East Enders considered this a must attend event -- over 1500 collectors and art enthusiasts attended the preview night party and guest numbers topped 7000 in total for the weekend. Throughout the weekend, notables including Musician/Actor Jon Bon Jovi, Actress Edie Falco, Marie Claire Fashion Editor and Project Runway Judge Nina Garcia, society figures Kathy and Richard Hilton and Bonnie Engelbardt Lautenberg, TV Reality Star and Interior Decorator Dina Manzo, Jewelry Designer Jennifer Miller, Broadway Producer Stewart Lane (War Horse and Priscilla Queen of the Desert) as well as Producer and Actress Bonnie Comley strolled the tent in search of their next art purchase. Local as well as international galleries reported successful outcomes with painting, photography and works on paper accounting for the bulk of sales throughout the weekend. Several large-scale items were sold at JHB Gallery, including two hand-cut paper works by Jaq Belcher and a John Noestheden silver crystal on paper piece. Sag Harbor gallerist Karen Boltax sold works by several artists including a Regina Scully canvas and a work on paper in addition to three works by Peter Opheim, Sylvia Hommert and Jackie Black. Italian gallery Arte Nova sold a large-scale photo by renowned photographer Massimo Vitali. Morgan Lehman reported sales of several works by Nancy Lorenz and photographer David Allee and, in addition, has several clients doing studio visits with painter Ryan Wallace as a result of their participation in the fair. New York gallerist Eli Klein reported strong sales and Nancy Margolis made several new clients and garnered a large-scale outdoor commission for artist Eva Hild as a result of her participation in artMRKT Hamptons.